This honey cake originated in Germany in the Middle Ages, and became a staple of the Jewish kitchen, finding a place as the traditional cake of Rosh Hashanah, the Jewish New Year. It symbolises a hope for a sweet and fruitful new year. 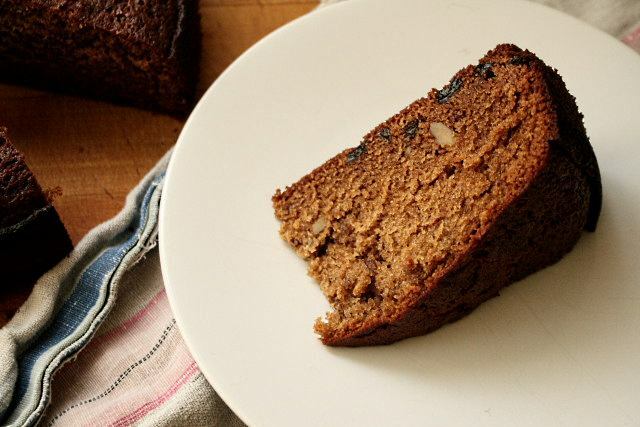 Many dismiss honey cake as one of those traditional staples that simply has to be made and served, regardless of the fact that nobody actually likes it, which reminds me of Christmas pudding. Does anybody really like Christmas pudding? Honey cake is often dismissed as either too dry, or unappetisingly moist. This version is neither – it’s fortified with coffee, a little rum and orange zest, packed with the flavours and spices of winter, and it keeps well. Rosh Hashanah passed a couple of months ago, but our Christmas and New Year is coming up, and this cake makes a change from the ubiquitous fruitcake or mince pies. Start with eggs and sugar … two large eggs and 200g of caster sugar, and beat them together with a whisk until they’re light and pale, then whisk in 125ml of vegetable oil, 250g of dark, liquid honey, two tablespoons of rum and 125ml of strong black coffee. In another bowl, mix together 300g of plain flour, two teaspoons of baking powder, half a teaspoon of baking soda, a teaspoon of ground cinnamon, a quarter of a teaspoon of ground cloves and a pinch of salt. Grate the zest of an orange into the flour, too, and mix it together well. Slowly add the dry ingredients to the wet ones, beating all the time with the whisk until everything is incorporated and turned into a thick batter. Dust 40g of sultanas and 50g of chopped walnuts in a little flour and add them to the batter. The thin coating of flour is supposed to stop the fruit and nuts from sinking to the bottom of the cake, but I’ve found it to be of dubious effectiveness. You may have better luck. Pour the batter into a 24cm cake tin, the base lined with greaseproof paper, and bake at 180c for at least an hour, perhaps up to an hour and a quarter. Check progress after fifty minutes and turn the heat down and cover the cake with foil if it seems to be browning too much. The cake should be left for a day or two to let its flavours develop. It won’t go stale, but it will taste deeper, earthier and richer for the wait. I love the idea of coffee in it! I’m one of those fortunate people that has never had a honey cake I didn’t like, but i’m really liking the sound of your version. Thanks for these notes on honey cake, I came here from Zak Avery’s excellent beer blog, Are You Tasting The Pith, I saw the reference to honey cake in the links on the right margin. I grew up with this tradition and can only agree with the commenter above – I never had one I didn’t like. My grandma’s was excellent, on the moist side, and I can still picture it in an old cake tin, lined with wax paper, in the right corner (next to the fridge) as you walked in the linoleum-floor kitchen. It was on the third floor of a (spacious) walk-up in east end Montreal, Canada. This was in the 1950’s and 60’s. Claudia Roden’s take on this dish is interesting, and perhaps reflects Moroccan or other North African influences. I believe there is nothing in the current German cake inventory quite like the Jewish honey cake, or maybe it survives in some areas as a local specialty. The excellent Bee Sting Cake is rather different. The French pain d’epices seems to resemble it more but the ones I’ve had are drier and, well, spiced. The American carrot cake can be similar. Our Montreal honey cake was flour, eggs, honey and maybe baking soda, c’est tout. But perhaps I shouldn’t say “our”, each family probably made it a little differently. Some of the moist Yorkshire cakes may be similar, parkin perhaps, although the samples I’ve had are denser. We always drank tea with it, Red Rose Tea. At that time in Montreal, not far from grandma’s place, Red Rose kept large offices and a huge sign on a 20’s or 30’s red brick tower announced the famed brand. So this is the memory you see, the drive from the west side to visit grandparents on Sunday, and you passed the Red Rose Building on the way, which got you thinking of the honey cake. I would think up until my teens I wasn’t served tea, but from 12 or 13 on I drank it with the adults. The other thing I remember about those visits was chocolate cake and jam roly-poly. And so in this trio were combined old country Jewish, American and English influences. I also had my first taste of beer in that kitchen. I’ll have to mention that at Zak’s place when an opportunity comes up.